Of the 45 Big Dawg skiers, 31 different skiers ran 38′ off during the preliminary rounds. In total, 38′ Off (or 11.25m) was run a total of 68 times between the preliminary & head to head events. 39′ Off (10.75m) was run a total of 14 times (8 times in prelims & 6 times by 5 different skiers during the head to head). Additionally, Bruce Dodd kept our TC busy this weekend with two performances (both 1.5 @ 41′ off) which will be submitted for Canadian National Records. 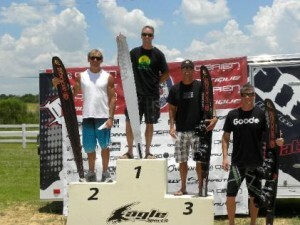 Todd Johnson won the opening qualifying event for the 2010 O’Brien Big Dawg Slalom Series Championship, presented by Nautiques, on Sunday at the Lakes of Katy in Katy, Texas. 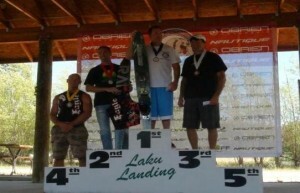 The 2010 O’Brien Big Dawg Slalom Series, presented by Nautiques, continued this past weekend with the second and final qualifying tournament taking place on Saturday and Sunday in Windsor, Colo. Matt Brown (Chico, Calif.) won the event, scoring 4 buoys at 39-1/2 feet off in Sunday’s head-to-head finale against Canada’s Todd Johnson, who scored 3-1/2 buoys at 39-1/2 feet off. The sweet 16 finalists from the tournament automatically qualify for the 5th annual series championship, which will be held Sept. 25-26 at the Isles of Lake Hancock in Winter Garden, Fla.
Hintringer, Harald – FL .